migrate Public Folders to different target environments like Exchange or Office 365.
choose to use native migration, PST import/export or third party tool for your migration task. migrate Public Folders to other Public Folders, to shared mailbox or to Office 365 Groups. Depending on which way you choose, there will be different aspects to pay attention to. Here you will find some references to each of these, but the main focus is on aspects of Public Folders to Public Folders migration in on-premises Exchange or Office 365. You will also find Public Folders migration tools suggestions and links to other articles you may want to explore. If your organization is still on Exchange 2003 or Exchange 2010 SP1, you won’t be able to do a direct move of Public Folders to the target server. The minimum requirement here for supported source environment is Exchange 2010 SP3 RU8 or later. In other words, you need to prepare for a double-hop transition. Downtime is a must so that you can perform the final move and complete the migration task. Until it finishes, users will have no access to Public Folders. The migration process is based on a set of PowerShell scripts you need to run in a correct sequence. Here you can download migration scripts required for the Public Folders migration. You need to create CSV mapping files. There is also a possibility to migrate Public Folders to Office 365 by using Outlook PST export. However, the size of the source Public Folders shouldn’t be greater than 30 GB. Otherwise, the auto-split feature in Office 365 won’t handle the massive unexpected growth and may stuck even up to two weeks before it completes the split. If it doesn’t sound to you a straightforward migration then you can look for third-party tools that will make the process easier and faster. 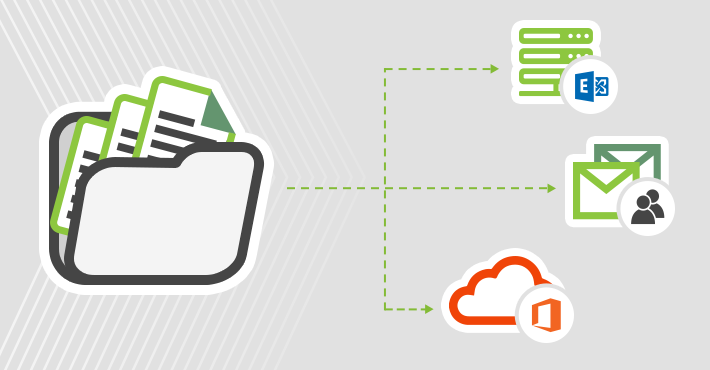 Public Folders migration is much easier when using third-party migration tools. The application that securely links two environments, automatically matches source and target Public Folders and eliminates downtime, can be a great relief. CodeTwo offers tools that you can use to simplify and speed up the migration of Public Folders. Depending on your migration scenario, you can use either CodeTwo Exchange Migration or CodeTwo Office 365 Migration. The first one lets you migrate Public Folders to on-premises Exchange Server and the second one allows for Public Folders migration to Office 365. The supported source server, in both cases, is Exchange, Office 365 or server supporting IMAP migrations like G Suite or Zimbra. The program automates the great part of the process. You can connect to source and target servers, where Public Folders reside, via intuitive built-in wizards. Once the connection is set up, the program will automatically find Public Folders and add them to the migration job. Prior to that make sure you created Public Folders on the target server. You don’t need to worry about running a whole list of PowerShell scripts and carefully watch if you execute them in a correct order. No need to create CSV mapping files neither. In cross-forest Exchange migration scenarios, especially when coexistence of source and target environments is not possible, the program overcomes that limitation and migrates Public Folders to the target with no middle steps. No downtime. Users can work without interruption during the migration of Public Folders. You can pause the migration process and resume it at any time. This will not cause any duplicates on the target server or any hiccups in the migration job performance. The Scheduler feature lets you decide when you want the program to automatically start and stop the migration process. You can choose specific weeks, days of a week and even hours to have the migration scheduled. The trial versions are free of charge and they let you play with the software for 30 days. The only limitation is that you will be able to migrate up to 10 items per folder. Migrating on-premises Exchange Public Folders to Office 365 – it discusses the aspects of Public Folder migration to Office 365. You can find there a list of activities you need to do before migrating Public Folders from Exchange to Exchange Online. How to migrate Exchange Public Folders to a shared mailbox in Office 365 – it contains a step-by-step guide on how to easily migrate Public Folders to a shared mailbox by using CodeTwo Office 365 Migration tool. Migrating legacy Public Folders to Exchange 2013/2016 – it explains the character of Exchange-to-Exchange Public Folders migration and provides a brief of how to use CodeTwo Exchange Migration tool to complete this migration task. Office 365 shared mailbox vs. Public Folders – it shows the differences and similarities between shared mailboxes and Public Folders in Office 365. Migrate your Public Folders to Office 365 Groups – a Microsoft article which discusses the difference between Public Folders and Office 365 Groups, explains whether you should or shouldn’t migrate Public Folders, and gives migration instructions.